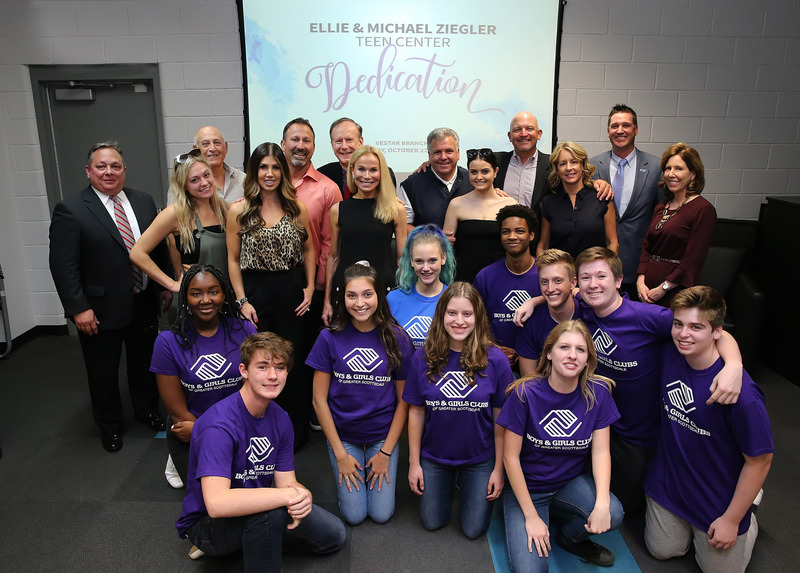 Boys & Girls Clubs of Greater Scottsdale (BGCS) formally dedicated the newly refreshed Ellie and Michael Ziegler Teen Center at its Vestar Branch in Desert Ridge on Monday, October 22, 2018. The renovations included new paint, flooring, a wall mural, new furniture, technology and safety updates, and the addition of a half gym to the existing Vestar facility built in 2007. The dedication ceremony marks the culmination of the 2017-18 One in a Million community matching challenge to fund new construction and revitalize the teen centers at Boys & Girls Clubs of Greater Scottsdale’s Thunderbirds and Vestar Branches. Community leaders Ellie and Michael Ziegler provided the matching funds igniting community support and donations for the teen projects in the Grayhawk and Desert Ridge communities. Nearly 100 teens attend the center at Vestar every day. One of BGCS’s busiest Clubs, Vestar has more than 2,500 registered members, 600 of whom are teens. “For me the Ellie & Michael Ziegler Teen Center is where I go after school to have fun with my friends, get my homework done and hang out in the computer room making music,” said Bella, Club teen and Keystone member. “We volunteer at St. Mary’s Food Bank and work on service projects to make our community better for everyone,” she explained about the Keystone academic and community service program. The Ellie & Michael Ziegler Teen Center includes the Rikki & Barry Chasse Games Room; the Cox Innovation Lab; the Terri & John Heitel Homework Room; the Kevin Rowe Teen Lounge; the Michele & Stephen Schwanz Teen Office; and the Liz & Mike Thorell Music & Multimedia Center. Julien recognized all of the investors for their contributions and commitment to youth and teens in Desert Ridge. The Vestar Club was named in honor of Vestar Corporation who provided the interior design for the refresh project. “Vestar Corporation continues to put kids and community first by helping with big and little things around the Club to keep it fresh, fun and safe,” said Julien.